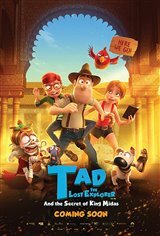 Tad Jones (Trevor White), a lovable construction worker who also studies archaeology, is in love with Sara Lavrof, a superstar archaeologist, although he's never admitted it to her. When she asks if he'd like to attend her talk in Las Vegas, in which she plans to unveil her research into King Midas, Tad jumps at the chance. He and his mummy friend travel to Vegas, but soon after Sara relays the exciting news that she's discovered the lost papyrus of King Midas, she's kidnapped by evil millionaire Jack Rackham. Tad finds a notebook Sara left behind revealing three locations where Midas's treasure is buried. He teams up with fellow archaeology student Tiffany, his dog Jeff, his mummy friend and a silent parrot called Belzoni to rescue Sara and keep the treasure out of Rackham's clutches.